Jesus, that is disgraceful! We should never be lower than 4.
Pepper wrote: Jesus, that is disgraceful! We should never be lower than 4. Yep. I can’t remember ever being picked that low in baseball. Unlike a school like UConn in basketball, who gets the benefit of the doubt even when they're bad, we get no residual goodwill from our reputation of usually being very good. If the 2018 season pans out as this poll suggests, any hopes for the Jewett era will be dashed. Such a finish will also confirm that a coach's obsession with how his players wear their socks is a recipe for disaster when trying to recruit today's capable players. And if the 2018 season doesn't pan out the way the poll suggests and we end up being very competitive, it will confirm that the people doing this poll were too lazy to actually do the research and just went by last years results. RobertM320 wrote: And if the 2018 season doesn't pan out the way the poll suggests and we end up being very competitive, it will confirm that the people doing this poll were too lazy to actually do the research and just went by last years results. They're not going by last years results. We finished 4th or 5th last year IIRC. They're going by the fact that we lost almost every major contributor except for Spoon. I don't disagree. My point being, if UConn has a bad year in basketball and ends up with almost a full roster turnover, they're still going to be given the benefit of the doubt regardless of who they're bringing in. We've almost always rebounded from a bad year to a successful season the next year. 8th,7th,3rd,7th and 10th. That was our finishes consecutively in the 5 years prior to David Pierce, so almost always rebound from a bad year might not be accurate. 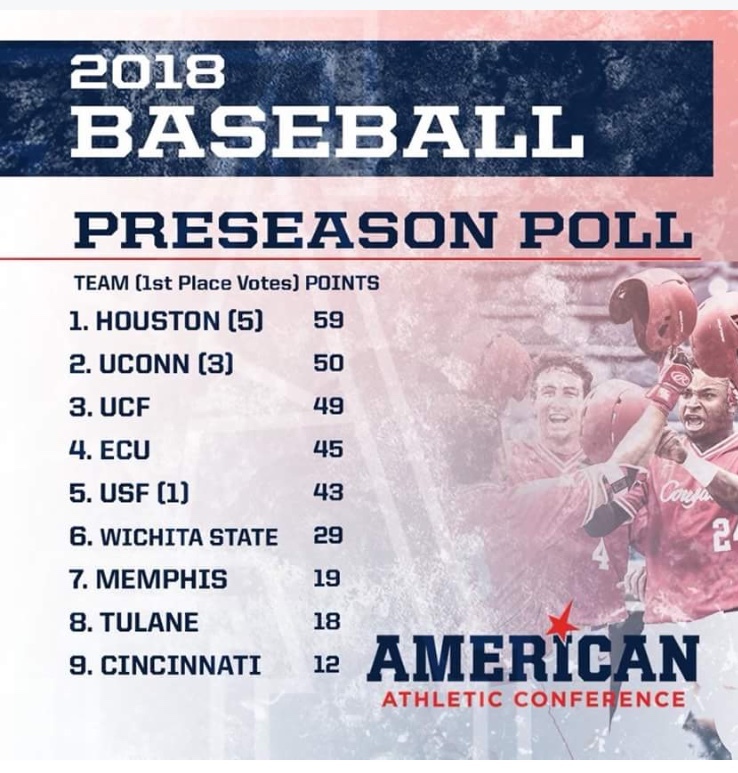 I don't like the cross sport comparisons but Tulane baseball isn't uconn basketball. Looks like they were right.